Whew, the past few weeks have been a WHIRLWIND! When I made the decision to become a reading coach, I left most of my teaching stuff behind. Setting up a classroom has been a mix of not having much like a first year teacher, but having the knowledge to at least know what I need and use. I'll have a class tour up soon but for now (before I forget!) 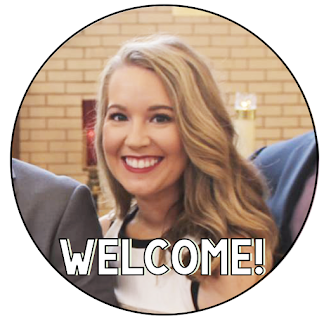 lets chat about Meet the Teacher! I had a wonderful turn out, I met 13 families and 1 family went to the wrong room. I only had 14 students the first day of school so all 14 coming to Meet the Teacher means 100% turn out! We started school on a Friday this year so we are anticipating more students will show up Monday. The rest of my team has much higher numbers so I'm hopeful for my kiddos! 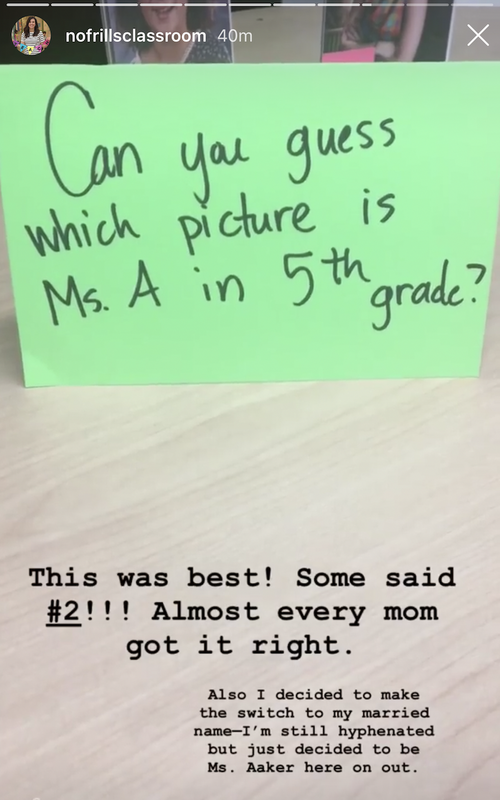 I also totally forgot to take any pictures on the day of Meet the Teacher! I fully intended to but there has been so much on my mind, my constant to do lists mainly! I made sure I snapped some the following morning though. 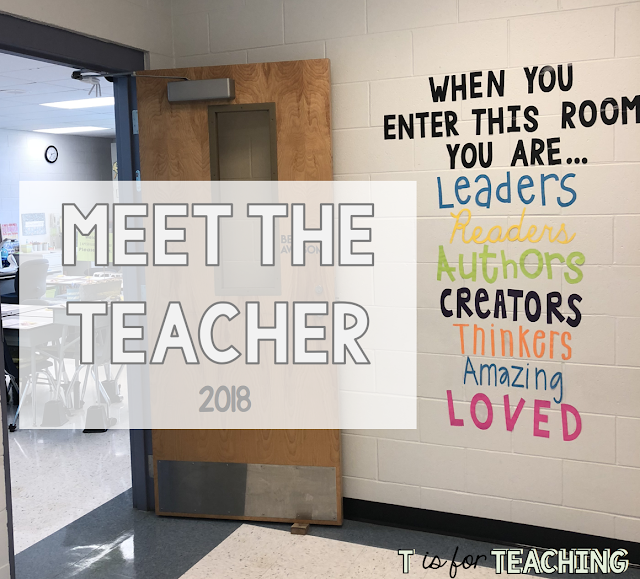 All of these pictures are actually POST Meet the Teacher. 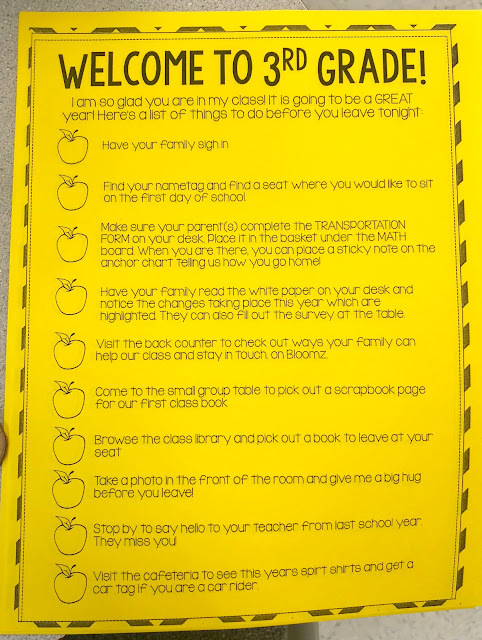 First families signed in and students picked up the yellow to-do list. It was funny observing students and how they approached their list. One student made sure he did every single thing in order, perfectly. Other students couldn't be bothered and just wanted to look around. Student's first stop was finding a seat! This was also amusing to observe. Some students were so hesitant and wanted to look at each seat carefully to pick the best one. Some made quick decisions and knew exactly where they wanted. And others didn't care too much. The boys all gravitated to the yoga balls! The first two spots taken were at the floor table with gray disks that are on the ground. One family called this the Japanese style table. I was nervous how parents would respond to their child sitting on the ground but they were all excited. 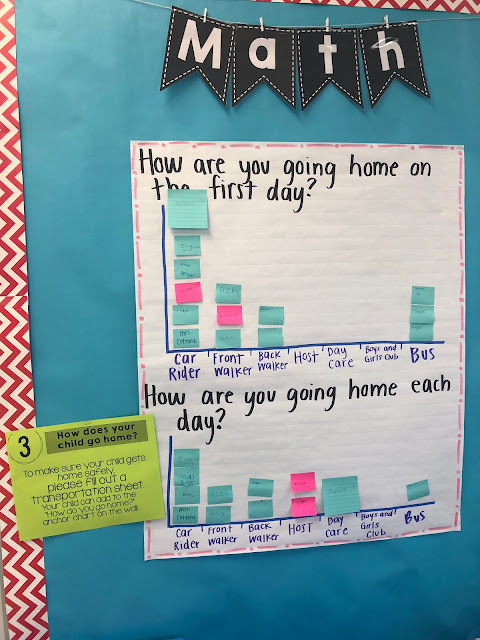 Once they found a seat, their parents filled out some paperwork and students added a sticky note to our graph for how they go home. 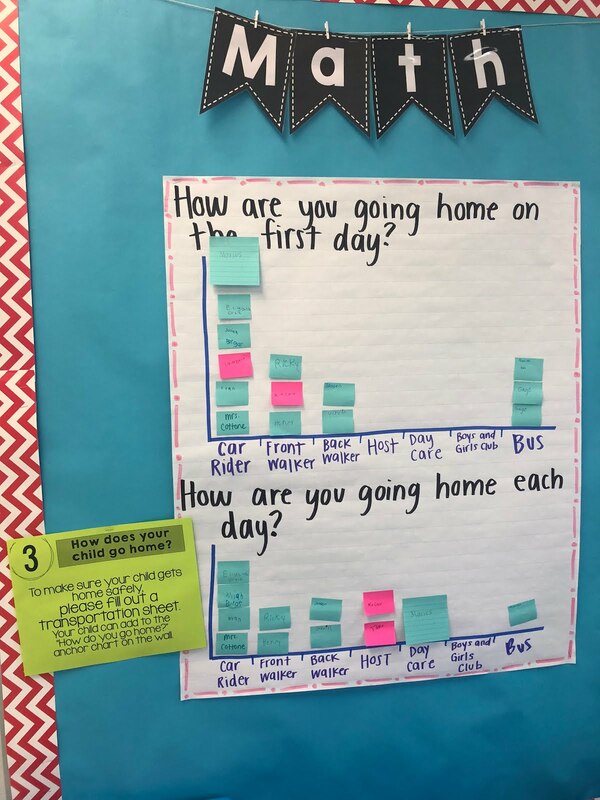 This visual was super handy for me on the first day of school to ensure everyone got home correctly. 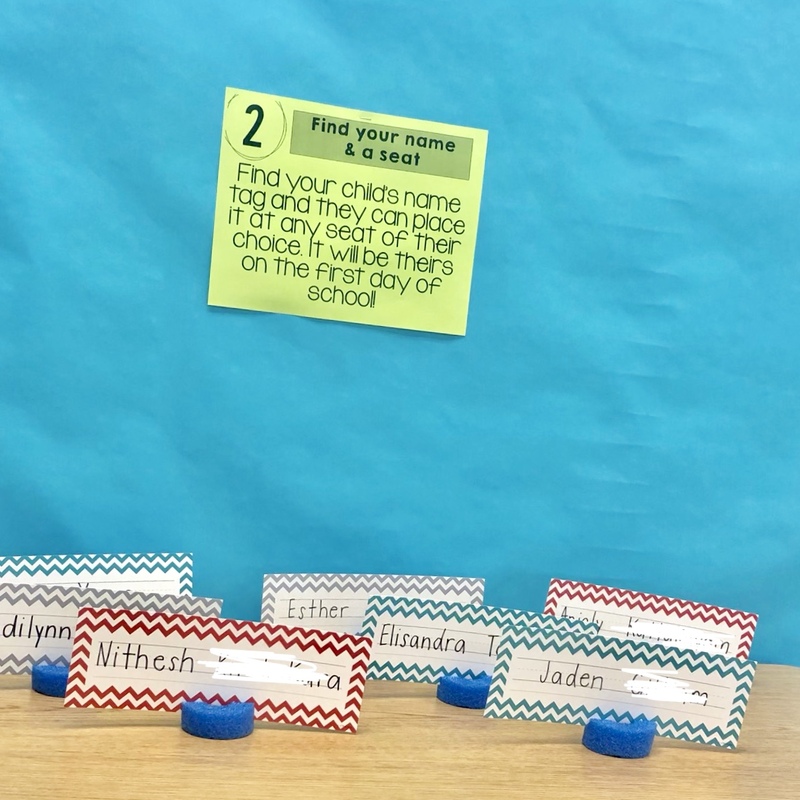 Next time, I'll have students names already written on sticky notes, that would help since I seemed to lose the pack of sticky notes all over the classroom, oops! Then they headed to the back counter where I had a wish list of optional items parents could bring in and our sign up sheet for Bloomz was back there. I've read a lot about Bloomz vs. Remind for parent communication, I went with Bloomz mainly because they have a sign up option for conferences and volunteer events. From what I've read, Remind does not yet have this. 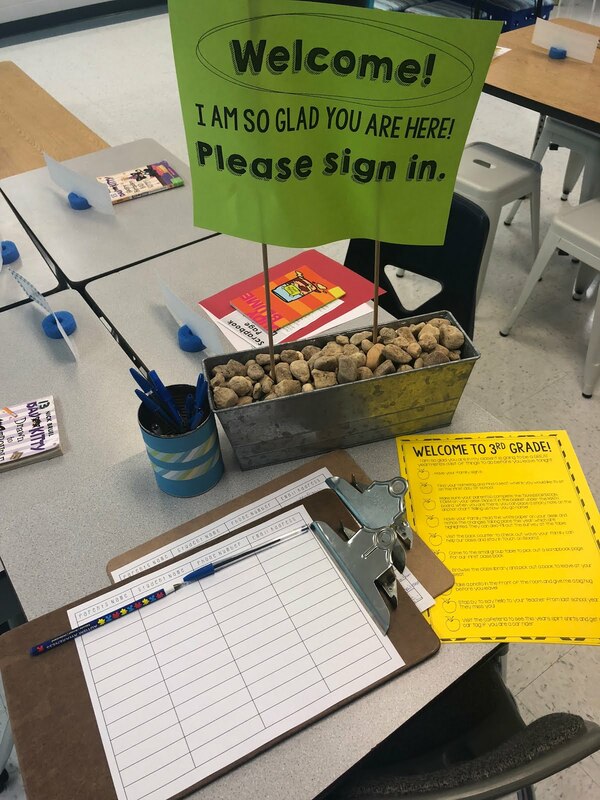 So far, I have 10 families already signed up on Bloomz and it came in handy on the first day of school when I had to message a parent about how her child goes home. I also was able to make an album and post pictures from the first day of school on there. I told parents I'll be posting pictures of our first day of school, please join so you can see the pictures. All of the parents I told that to signed up! Stop 5 included them picking out a piece of paper to make an 'About Me' page. I used to do Me Bags where students would bring in 3 items they wanted to share in a bag. I didn't feel like I really got to know the students after those since most students would bring toys. 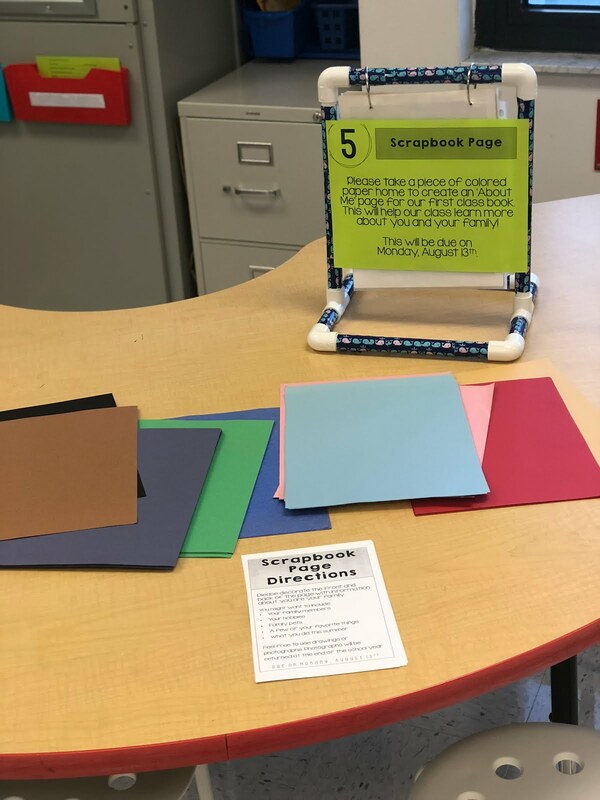 I'm hoping to learn more from each child with a scrapbook page! I already had one student turn her page in, it is adorable! All of the scrapbook pages will be compiled to make our first class book. 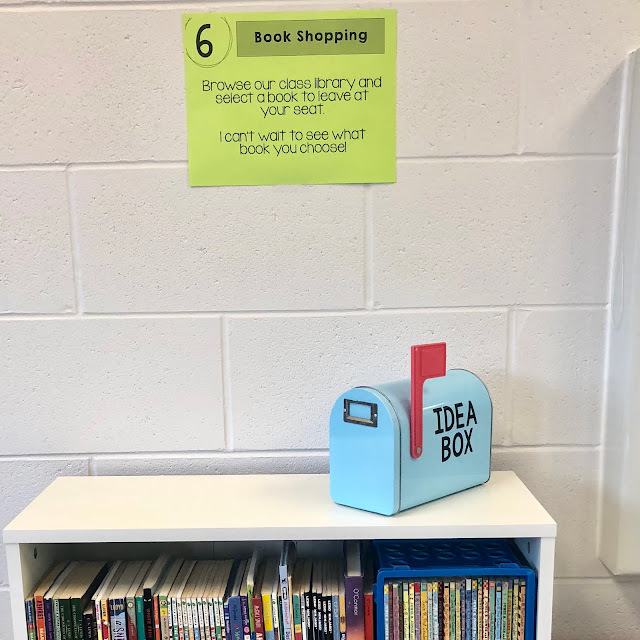 Students then checked out our class library and picked out a book of their choice. I never have done this at a Meet the Teacher night but I loved getting a chance to look through my class library with students and ask what types of books they like. It also helped me see what books I should buy more of! 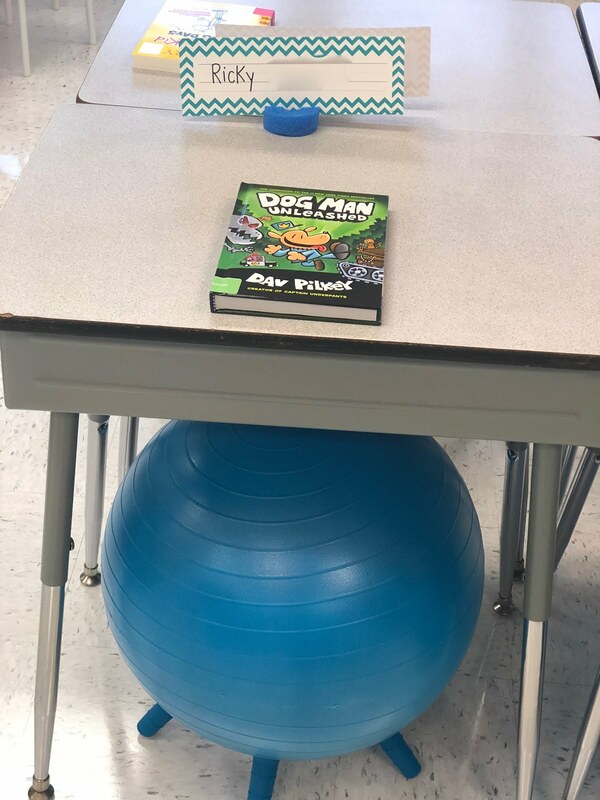 Setting the stage for reading with a self-selected book on each child's desk when they entered on the first day of school! The last stop was taking a photo in the front of the room. I wrote "#BestYearEver" on a bright sentence strip and students held that sign. Of course I forgot to take a photo! This is a photo from the first day of school, this sign came out then. 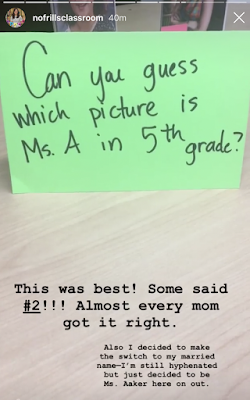 Next year I'd like to add station of the students and parents having to vote which picture is me from 3rd grade. This idea is from @NoFrillsClassroom on Instagram. I love following her! I also want to have an area where they can vote for our first class chapter book read aloud. It was a great event. I didn't anticipate the parents LOVING the flexible seating choices as much as they did. The parents were so enthusiastic and excited, the students were kind of looking around nervous. Everyone left feeling like it was going to be a great year, me included!